The Town of Oyster Bay is planning to sell a plot of landlocked property in a deal real estate executives say may pave the way for a long-proposed mall at the site of a former Cerro Wire factory. The 15-acre town property, a former landfill and now part of a Public Works Department yard, lies just northeast of the 39-acre site owned by Michigan-based Taubman Centers. The developer has spent more than 16 years and $150 million trying to build an upscale mall there. The town listed projected revenue of $17.5 million from the DPW land’s sale in its recently approved 2013 budget. A spokesman for Taubman, which is embroiled in a lawsuit challenging the town’s opposition to its project, declined to comment on whether it was interested in acquiring the land or what its next move regarding the mall would be. “Given the fact that the developer and the township remain locked in litigation, we are not in a position to comment on speculation or third party commentary regarding the status of the property,” Taubman spokesman Gary Lewi told LIBN via email. Oyster Bay Supervisor John Venditto also declined comment on the planned sale of the land. But local developers point to the property’s proximity to the proposed mall site and the fact that it has no access from public streets as signs that a deal with Taubman is likely. Combining the two properties would ease the density of proposed construction at the site, possibly smoothing civic opposition. “That piece of land could only work for the entity that owns the development rights on the adjoining parcel,” said Michael Polimeni, whose company, Polimeni International, has developed millions of square feet of retail space in the United States and Europe. David Pennetta, a principal in Jericho-based Oxford and Simpson Realty Services and president of the local chapter of the Commercial Industrial Brokers Society, also said Taubman was the leading candidate to buy the parcel. “They would be interested in buying it if they were allowed to move forward with the mall,” he said. Town Councilman Anthony Macganone, the lone town board member who has voted in favor of the mall, said selling the plot to Taubman and green-lighting the mall project would be a windfall for the cash-strapped town, which narrowly avoided layoffs in its latest spending plan. “You’re talking permit fees in the millions,” he told LIBN. Indeed, Taubman has pitched the project as a much-needed boost to the regional economy, with 3,000 construction jobs, 2,000 retail jobs and $50 million in annual tax revenue in the offing. But neighborhood opposition has been fierce, with area homeowners objecting to the project’s size and future noise and traffic problems. 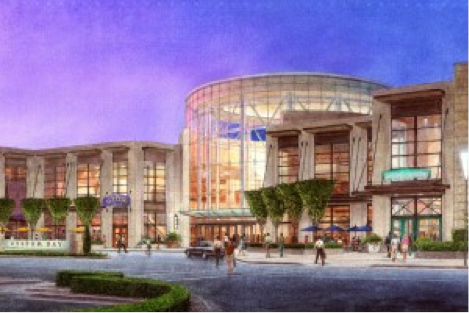 They have been financially backed by Indianapolis-based Simon Property Group, a Taubman rival that owns or operates four local shopping centers on the Island, including Roosevelt Field in Garden City and Smith Haven Mall in Lake Grove. Howard Avrutine, an attorney for the neighborhood group opposing the mall, declined comment on the town’s land sale. Taubman suffered a setback in April when the long-planned anchor tenant for its Syosset mall, luxury retailer Neiman Marcus, announced it would defect to Roosevelt Field as part of a $200 million redevelopment. That store is slated to open in 2015. The proposed mall site, which fronts the North Service Road of the Long Island Expressway at Exit 43A, once housed manufacturing operations of the Cerro Wire & Cable Co. The firm left Long Island in 1986 and now operates in Alabama and Indiana as part of Warren Buffet’s Berkshire Hathaway conglomerate. Taubman paid for an extensive cleanup of the property, which had been acquired by onetime publishing giant the Tribune Co. Despite the snarl of litigation, the Taubman project received a significant boost last year, when it was designated “regionally significant” by the Long Island Regional Economic Development Council, paving the way for future government subsidies. In April, LIBN reported that the state was also considering the council’s recommendation that the New York Department of Environmental Conservation take lead-agency status on the project, which would allow the agency to fast-track required government reviews. That may create movement on the long-stalled development project. “The state stepping in and challenging home rule on regionally significant projects will certainly help them move forward,” Pennetta said.